Image based on architect's conceptual design and subject to change based on the schematic design process currently underway. The McGregor Computer Science Center is the new name for the building previously referred to as Academic Building One (AB1).  The physical plant of Harvey Mudd College has changed over the years, but it has always hewed to a central theme—buildings facing inward to promote the unique culture of collaboration and strong relationships among students, faculty and staff of the College. While historically this approach has served the College well, today we have a unique opportunity to create a bridge connecting HMC to the other Claremont colleges and the community. As we envisioned the design of Harvey Mudd College’s newest academic building, we worked with the architects to design our first outward-facing building. This design creates a welcoming gateway through which faculty and students from across The Claremont Colleges can pass to further accelerate the exchange of talent, creativity and resources that exist among our sister colleges, while also meeting a significant need within the Harvey Mudd College community. The second and third floors of this three-story, 36,000-square-foot academic building provide a much-needed new home for the rapidly growing Computer Science Department, which will further expand its already highly collaborative work across all HMC departments, with faculty and students from The Claremont Colleges as well as with industry and educational institutions across the country. Computer science (students majoring in some form of CS) now rivals engineering as one of the most popular majors on campus, and the number of non-HMC students taking courses and majoring in CS at HMC has tripled. Construction of the new academic facility will help offset this demand by creating room to grow from 16 to 25 faculty positions over time and will include faculty offices, Clinic and project studios, teaching and research laboratories and collaboration spaces. The larger space dedicated for computing will allow us to create more contiguous CS space, bringing together previously fragmented elements such as student project space, Clinic Program work areas and computer labs. The first floor of this new gateway to Harvey Mudd will be a multi-disciplinary, collaborative Makerspace, where faculty and students from HMC and across The Claremont Colleges can gather to create, invent, tinker, explore, build and discover using a variety of tools and materials. It will also add the potential for community outreach programs that engage more K-12 students in the “maker movement” thus further exciting their interest in pursuing studies in science, engineering and mathematics. Harvey Mudd is particularly interested in the creation of makerspace to further enhance curricular changes in all academic disciplines. This new space will be adjacent to and linked with repositioned Libra Complex engineering machine shops, while offering enhancement to several programs across campus and across The Claremont Colleges. The College initially received a $1 million gift to help complete the initial planning phase, including conceptual design. Through this process, the total cost of the building was determined to be $30 million, of which $17.2 million needed to be raised in gifts and pledges (including the planning grant) before the board of trustees could approve the project to move forward. The remaining amount, if additional gift dollars are not secured beyond the $17.2 million goal, will come from debt financing included in the long-term operating budget forecast. There are still many opportunities to invest in this exciting project so that additional debt resources can be freed up for facility projects that will quickly follow the new building’s completion. Naming opportunities are still available and more information about other ways to participate will be communicated to the HMC community. The complete project timeline will be approximately 30 months. 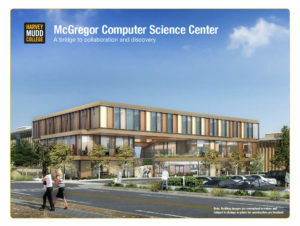 With the critical first phase of funding secured, the College is moving toward making the McGregor Computer Science Center a reality. Work has already begun on the required pre-construction services and the schematic design phase of the project. This will allow us to further engage the campus community—including CS faculty and the multi-disciplinary makerspace committee—to re-evaluate and refine some elements of program and planning, as well as to update cost estimates based on schematic designs, value engineering and scope refinement. At the conclusion of this phase, construction is anticipated to begin in summer 2019 and last up to 18 months, being completed in early 2021.